The tool allows the public to locate WMAs by name, by county, by recreation choice and even by whether or not wheelchair accessible facilities are available. Clicking on the name of a WMA opens the link to the homepage for that WMA. 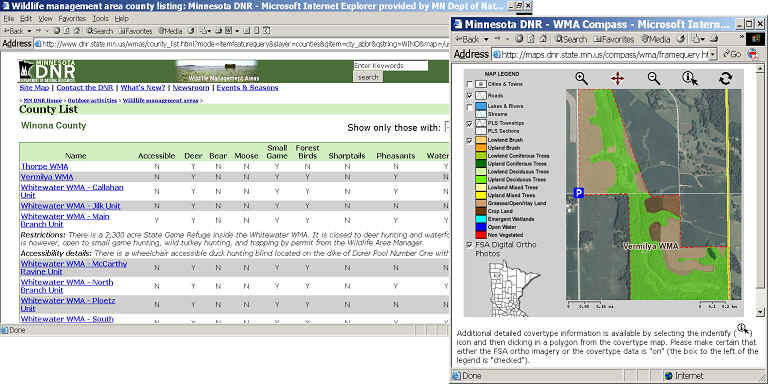 The homepage contains narrative information describing the WMA, a link to an interactive map used to display vegetation, parking lots and aerial photos and a link to more detailed information if it exists. Back on the main page of WMA site, users can also click on a .kmz file to open Google Earth and locate WMAs with that application. The user can pan and zoom to a WMA, then click on either the parking lot or name of the unit and open a link to the homepage for that WMA. Contact Steve Benson at steve.benson@dnr.state.mn.us or Steve Lime at steve.lime@dnr.state.mn.us for more information.